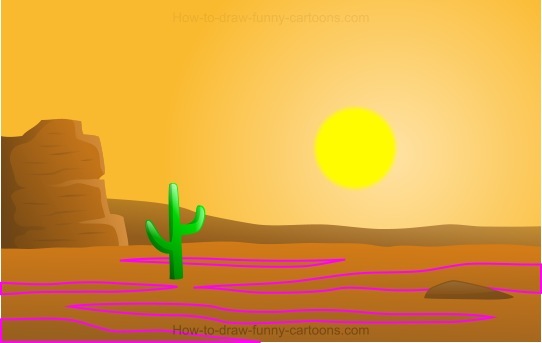 Learn how to draw a cartoon desert filled with warm colors, cool effects and simple shapes! To create this simple illustration, having access to a vector application is a good idea. 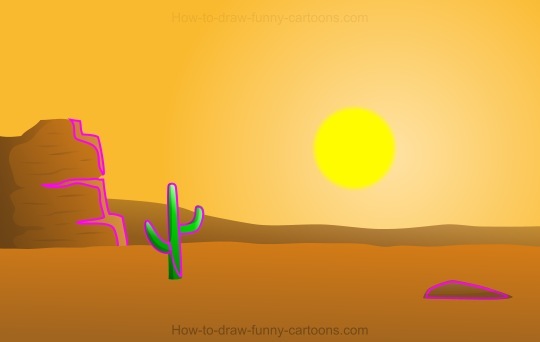 I will show you how to draw a fun illustration of a desert using mostly simple elements and basic effects. Please note that pink outlines are only used to help you see what you need to do in each step. First, you can sketch the elements visible in this image using basic shapes like circle and rectangles. All shapes can be filled with plain colors for now. Remember that we are creating a desert, so you don't need to add too much details and objects. Next, you can select the gradient fill tool to apply a second color on all objects from the illustration. The goal is to create volume and depth. Behind the sun, add a circular fill and make sure that the area around the sun is bright. You can also blur the outline of the sun. 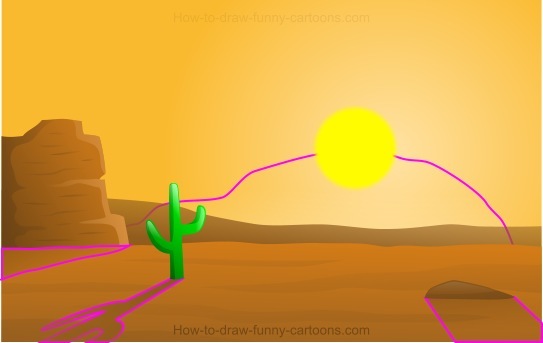 It's now time to draw new elements to create more volume on the mountain, the cactus and the rock. Draw darker shapes on these objects and use transparency to make sure that the result is subtle. Repeat the same technique, but this time by drawing bright shapes filled with a white color. Once again, use transparency to partially hide these shapes and create a subtle effect. Let's take a small break to see the result so far. 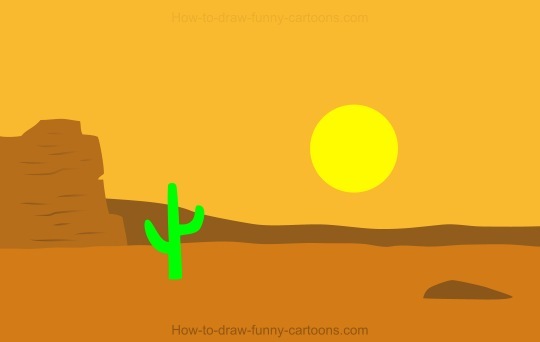 As you can see, the rock, the mountain and the cactus have more depth compared to step number one. On the ground, draw dark shapes to add a little bit of texture. Use transparency to make the effect more subtle. Draw a large shadow behind the mountain, the cactus and the rock. You can also draw a large circular shape below the sun to make the horizon brighter. On the sun, add a large circle filled with a bright yellow color. This new shape can be slightly transparent too. A star can also be drawn and partially hidden to create another subtle effect. Finally, if you want to simulate a lens flare effect, simply draw a couple of rings and circular shapes like shown below. These shapes must be white and yellow. Adding transparency is also a good idea to end up with a realistic effect.